So after Jack took the year off from the Cheetahs last year and re-started this year, Alex has been taking him to practices. 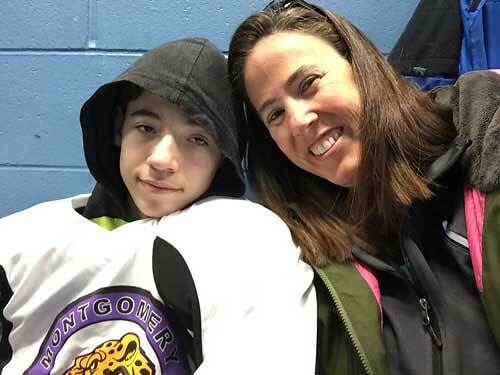 Prior to this year, it was almost always me who took him, but Alex really enjoyed hanging out with him the few times he took him so he volunteered to be Hockey Parent this year, which was great with me because I don't like getting up at 6:30 am on Saturdays. Alex was even going to take Jack on this hockey tournament trip but then *work something something work grumble work something* and I ended up going with Jack instead. At first I was a little annoyed because I LIKE TO STAY INSIDE MY HOUSE AND NOT GO OUTSIDE OR CHANGE MY SCHEDULE OR INTERACT WITH OTHER PEOPLE, but I am so happy and lucky that I got to go because it turns out that The Magic of Special Hockey is still real and happening and wonderful and also because I wouldn't have been able to do as much day drinking had I stayed home and Alex had gone on the tournament. These tournaments do involve, like, a billion-hour bus trip, which isn't the greatest, although we do get to watch hockey mainstay movie Miracle on the bus DVD player every time. Jack played video games with his friend for about a half hour and then started feeling sick. After the Bus Barforama™ from the tournament two years ago, neither he nor I wanted to experience that again, so he sat next to me and stared straight ahead for the next six hours. Jack’s two positions on the bus. Also, having that finger straight up seems to be an important part of playing DS for the kid. 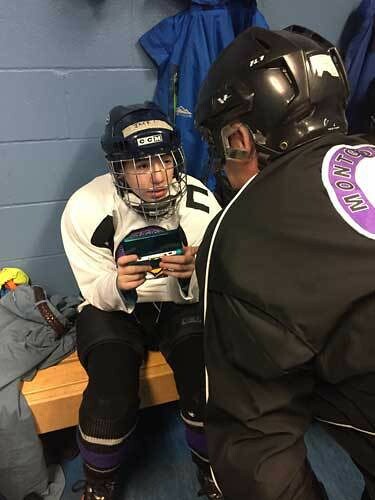 This, of course, left Jack totally free to tell me all about all the video games he played as well as to harass others, like when one of the hockey dads stopped to talk to me and Jack was all, "Are you flirting with her?" (he wasn't) followed with an emphatic, "SHE'S MARRIED." Classic Jack. Incidentally and ironically, Quinn was hit in the head by a hockey puck at school that day. 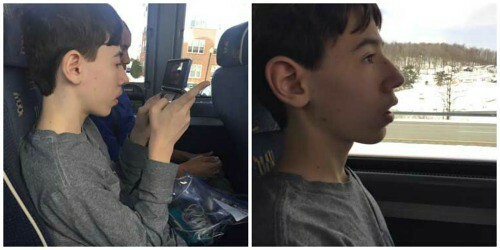 We arrived in Jamestown, checked into our hotel, and Jack finally got to play all the DS that I'd promised he could play on the bus. Me: Jack, do you want to swim/eat/shower/hang out with a friend? There were three eating establishments within a sightline of the hotel: a Bob Evans, a McDonald's, and a gas station. (Yes, gas stations count as eating establishments.) That night a big group of us went to Bob Evans and then the kiddos went swimming and then we went to bed. The next day, Friday, Jack didn't have a game until 2:45, so we went to McDonald's for breakfast, then went back to the room where he did the same thing as in that photo up there and I read for a while and took a nap and then we ate lunch at McDonald's and then finally got on the bus to go to the ice rink. It is here that I need to tell you about Jack's new philosophy about playing hockey. 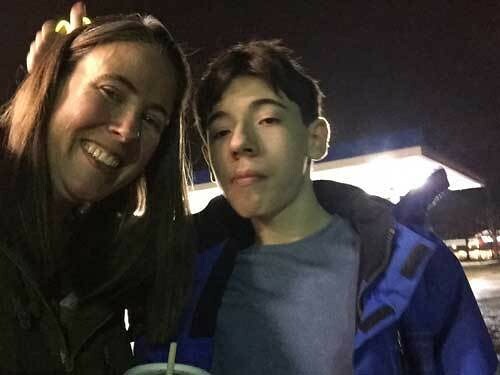 A few months ago, one of Jack's teachers gave the class an assignment to do something outside of their comfort zone over the weekend. 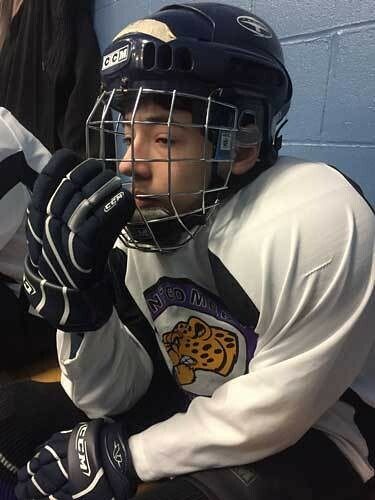 Because he had a hockey game that weekend, he decided that the thing he would do would be to actually put effort into playing the game. 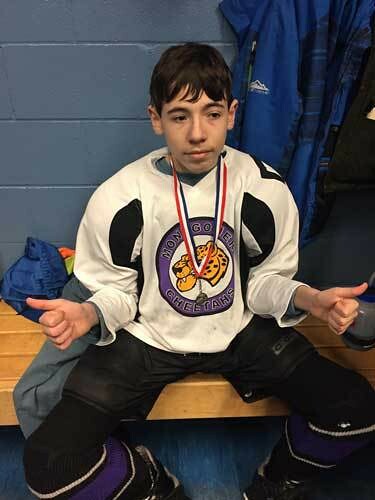 Things turned out well for him and instead of lying on the ice and taking leisurely laps around the rink, he worked hard, scored a goal, made an assist, and generally rocked the casbah. After such a good experience, he evidently decided that this is now his new comfort zone behavior for hockey games. I hadn't been at that first game where he put in effort so I was really excited to see him work it here. And work it he did. He did such a great job. I was super impressed. We had a couple of hours before the next game, so some of the players hung out at a table in the rink restaurant and some of the parents sat at an adjacent table and commenced to drinking, what with our not having to drive anywhere AND it being St. Patrick's Day and all. Thus we waited out the time until the next game at which Jack also expended good effort. He is the greatest. Because I am not the greatest, I don't remember at which game that first day that he scored his goal, but he did and it was AWESOME. He's come a long way. And not just in goal scoring. He chases the puck, he passes the puck, he is generally just an effort-expending hockey player. He is all kinds of cool. 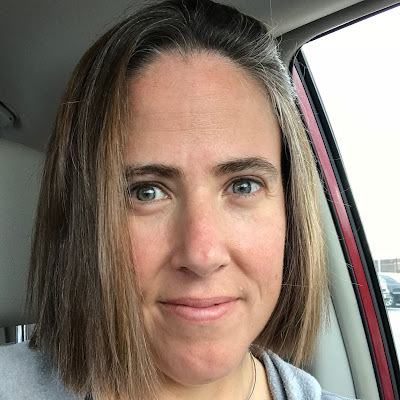 After the game, not wanting to return to McDonald's for a third time in the same day, another mom and I wandered around unsuccessfully looking for a place to eat until we ran into a couple of dads who were headed to a pizza place. We became taggers on and were rewarded with delicious dinner, which we consumed just in time to make the bus back to the hotel. It was a really happy day for both Jack and I and it made me feel a little sad for Alex that he wasn't able to experience it. I've always been the one to take Jack on his hockey tournaments, so he's always missed out. But at the same time as I was feeling a little sad for Alex, I was feeling very happy for myself and full of satisfied emotions because I was so lucky to be able to spend this time with Jack. Saturday morning we had a game at 8 am, so we had to get up and moving early. This is Jack waiting for the bus to the rink. 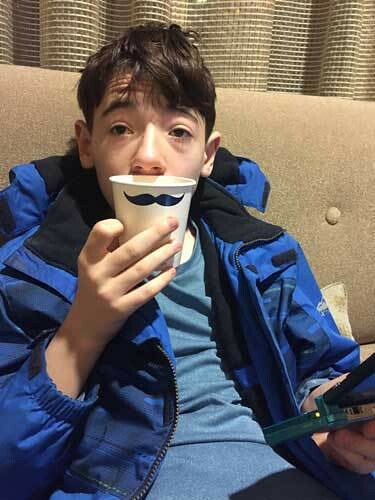 He mustache you a question. Because Jack is awesome, he scored two goals and continued to be awesome at that morning game. I insert these next photos so you know that going to a hockey tournament actually includes ice skating and playing hockey. Jack being a hockey player. Jack loves doing the face-off and generally is kind of pushy about taking his spot there. I don't have a lot of memory of what happened between games. That is the problem with writing a blog post two months after the event. Did we go back to the hotel? Maybe. Did I feed Jack lunch at the rink? WAIT A MINUTE! I remember! We went back to the hotel where I bought Jack doughnuts and I think I took him swimming but there was no one else down there so he was lonely and we went back to the room before we went back to Bob Evans for lunch and I ate lemon pie for dessert. I never forget lemon pie. Jack had his last game that afternoon. After steadfastly refusing to be a captain all weekend (I think he thought it might involve extra work or motivational speaking or something), Jack finally agreed to step up and wear the "C" that made him Captain Jack for 45 minutes. Here is the head coach giving Jack a pep talk about being captain. 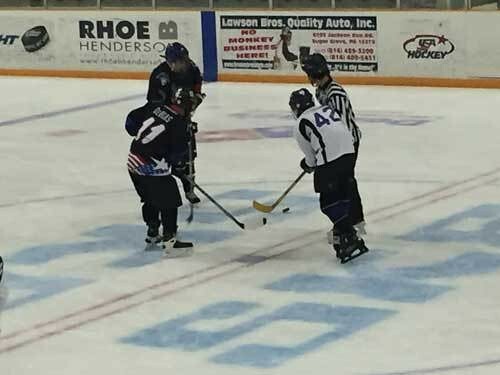 There is something about sitting in the stands with other special hockey parents watching your athlete play and seeing the coaches grin and encourage all of the players. It is really hard to explain, but there is something amazing there. I felt it so strongly that weekend watching all those terrific kids and young adults play. Plus everyone got a medal because they are awesome. From there, it was back to the hotel for more swimming in a pool that soon roiled with children, followed by a pizza party. You can't get better than that. Or can you? What if your mom is half drunk and decides you need a late-night snack walk to the gas station where she will buy you a king size Big Kat? That's even better. Because candy and soda right before bed is kind of a thing that Team Stimey excels at. 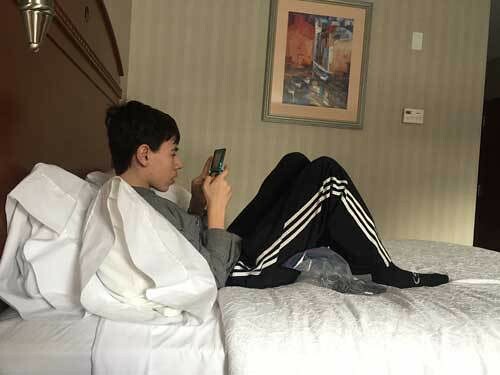 One of the teams had a game Sunday morning so Jack got to watch funny videos of dogs and cats in the room and then with his teammates in the lobby of the hotel. Then he sat on a bus for six and a half hours staring straight ahead again. And that was Jack's triumphant return to tournament hockey. We really could not have had more fun. There was a really fun group of parents there for me and so many nice players for Jack to hang out with, including his best friend, which is always a bonus. Thank you so much to the parents who organized this trip. We appreciate your work so much. You made the weekend both fun and magical for us—that's not easy to pull off. And to the coaches, you skate every game for three Cheetah squads and you wear genuine smiles throughout every one. You are my heroes. Thank you. If, after reading, you (yes, you) would like to support the team, please head over to https://www.crowdrise.com/annual-cheetah-thon where you can make a donation. Jack and the rest of the Cheetahs would be so grateful. This team has made such a difference in our lives and I know we're not the only family who feels this way. This is a really unique and incredible team and we appreciate so much your emotional and financial support. What a great weekend! Jack is awesome. And you are MARRIED! Don't forget. 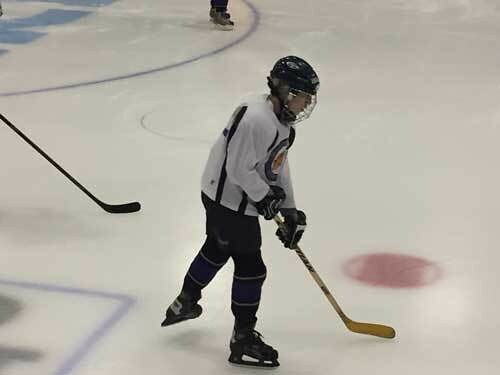 Thanks for sharing, hope that Jack will have the high spirit to play hockey better.